A few weeks ago I instagrammed this picture of Garrett eating a homemade popsicle by the pool. This is the green one from a Norpro Silicone Ice Pop Maker Set that I bought for about $9.00 on Amazon. When I was a kid my mother used to make us homemade ice pops by freezing Koolaid in Tupperware molds. I can still remember the smell of Tropical Punch flavor with that weird powdery whang to it. Ah, it makes me all nostalgic just thinking about all those Koolaid mustaches. So, when I stumbled upon this post from 100 Days of Real Food I knew I needed to buy a set of those ice pop makers that she recommended so I could make some homemade popsicles for G! But instead of whangy Koolaid I filled his with leftover blueberry/ raspberry breakfast smoothie so he’s getting some antioxidants all sneakily and stuff. Here is the recipe in case you’re interested! I sometimes add a scoop of whey protein or some flax seeds if the mood strikes. Blend until smooth, drink half of it for breakfast, realize you’ve made WAY too much, then pour your leftovers into these silicone ice pop makers. Freeze, and eat around midday when temperatures are at their hottest. With temps over 100 degrees for the past two weeks they couldn’t have come at a better time. 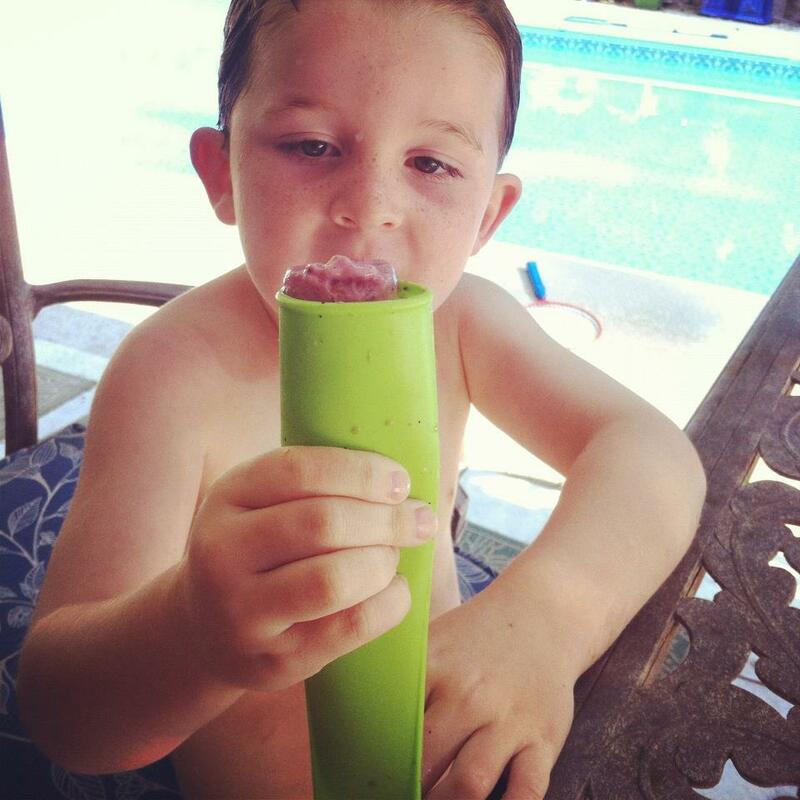 Garrett LOVES these homemade popsicles, and I love that they are healthy for him! What’s that they say? Kid tested, mother approved. Totally the case here. WARNING! If you have a preschooler be sure to explain to your kids that these aren’t regular popsicle wrappers. Garrett was being a big helper and cleaning up our “trash” and threw away our blue and green popsicle molds on the day this pic was taken. I didn’t even realize it until a few days later when I went searching for them and couldn’t find them anywhere. I almost blamed the dogs for using them as a chew toy, but then G told me he had thrown them in the garbage. Hope you guys enjoy your summertime treats and most importantly, STAY COOL! Those popsicles sound delicious! I love all the berries. We have those same popsicle molds – love them! That popsicle does sound awesome and I want a set of those molds!! Thanks Beth! I make that same smoothie every morning (but with no ice, I use OJ), with flax seeds and all but I never thought to freeze it – duh – you are one clever cookie, thanks so much and I’m making those this morning!! Perfect timing posting this! 🙂 i’m pinning! So you really like those molds? I saw them but just wasn’t sure if we’d love them or not. Are they easy to clean?